Biofilm formation on external ventricular drainages (EVDs) has been postulated as the main pathogenic mechanism for EVD-associated ventriculitis. However, biofilm on EVDs has never been systematically studied and the in vivo effect of antibiotic-impregnated EVDs on biofilm has not been assessed. 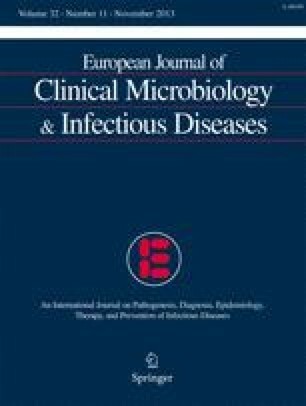 The aim of this study was to measure the prevalence of biofilm formation on EVDs and to analyze the influence of antibiotic-impregnated EVD on the risk of biofilm formation and ventriculitis. Consecutive patients with EVDs were included in the study. Surveillance cerebrospinal fluid (CSF) cultures were performed twice a week. Withdrawn EVDs were cultured using standard bacteriologic techniques and examined under a scanning electron microscope. We collected 32 EVDs, 18 of which (56 %) were antibiotic-impregnated EVDs. Biofilm was present on 24 EVDs (75 %), ventriculitis was diagnosed in 6 patients (19 %), and colonization occurred in 12 patients (38 %). All cases of ventriculitis were due to Gram-negative bacteria. Biofilm was more frequent on EVDs originating from patients with ventriculitis or bacterial colonization. Impregnated EVDs did not avoid ventriculitis or colonization, but biofilm development on these devices depended on the time from insertion and varied from 67 % for those used for <7 days to 88 % for those used for ≥7 days (p = 0.094). In conclusion, biofilm is a common phenomenon on EVDs. Currently available impregnated EVDs could not avoid ventriculitis due to multidrug-resistant Gram-negative bacteria, but a trend of delayment of biofilm development was observed.